There are some problems with pyuno in OOo3.0.0 (in particular with the python executable). Here the known problems and the workarounds for the moment . This is because the types could not be loaded due to changes in the uno bootstrapping mechanism. You can work around it for now by setting the URE_BOOTSTRAP variable (adapt to your installation path, replace every space with a %20, change \ to /). (windows only) Interactive mode in python does not work correctly When you start the python executable without parameters, the interactive session runs somewhat fuzzy (at least on my machine). When you get the prompt >>>> , everything you type will be interpreted as a shell command. When you then just press return, you are prompted with your current working directory, here you can place a python command, so in short, you have to press return 2 times after every python command (95037). ( unix only), you need to set LD_LIBRARY_PATH correctly before starting the python executable, eg. - PyUNO needs you ! Find here a shortened Spanish version of this document. 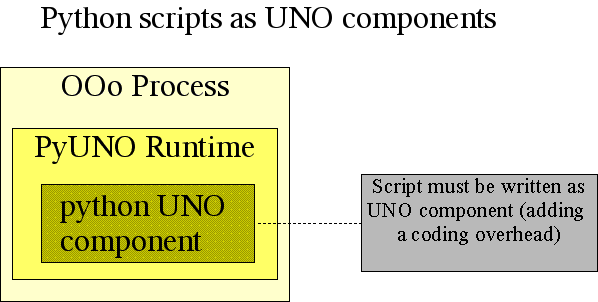 to develop UNO components in python, thus python UNO components may be run within the OpenOffice.org process and can be called from Java, C++ or the built in StarBasic scripting language. You can also download this documentation for offline work. The documentation in its current state is targeted at developers who have already some experience with OpenOffice.org API and with some other programming language (Java/C++/StarBasic). It is recommended that you read that some background information from the developer manual before looking at the specifics of python. This tutorial shows, how the PyUNO bridge can be used to automate OpenOffice.org. This is not an OpenOffice.org tutorial, there is lots of resources available in the office development kit and the developer manual. Since OpenOffice1.1, PyUNO is included in the default installation. want to trigger script execution by starting a separate process (e.g. a cgi-script within a http-server). # I do this here by calling a cheap synchronous call (getPropertyValue). Note: You must use the script/batch file in the program directory to start python, simply starting the python executable in the runtime directory (or from python installation installed somewhere else on your machine) will not work. This scripts prints "Hello World" into the current writer document. The above Hello World example is now recoded as a python UNO component, which means, that the code that does the insertion needs to be embedded in a python class. Additionally, the connecting-to-the-office-code needs to be replaced by a distinct entry point, which is used by the python loader to instantiate the python class. # and from the interface(s) you want to implement. Both files must be packaged up into a single zip file by using your favourite zip utility, e.g. infozip. This package can then be deployed into an OpenOffice.org installation using the pkgchk tool, which is located in the OOo program directory. Note, that the office must have been stopped before installing the package. Note: Make sure, that the PYTHONPATH environment variable is NOT set when you start pkgchk or soffice (see #i17339#). This may require, that you create a batch file for soffice on windows, unset PYTHONPATH in the system configuration or always start soffice from the shell with set PYTHONPATH= (windows) or unsetenv PYTHONPATH (Unix tcsh shell). On success no output is given by the tool. When OpenOffice.org starts there is a new menu entry (see Tools/Additional Components/Insert Hello World). As you have seen, the core script lines are identical, but the ways to retrieve the office component context differ. A command line tool, that extracts the text, html or pdf content from a StarWriter document and writes it to a different file or (optionally) prints it to stdout (grep your office documents). A command line program, that fills a writer document with some text and tables. Same as above, but implemented as a python UNO component, so that it runs within the office process. This shows the performance benefit of having scripts run within one process. You must add the swritercomp.py program with the pkgchk tool (see below) to the office installation and can then use the swritercomp_client.py program to execute it. A command line program, that displays the contents of the biblio sample database that comes with OpenOffice.org. to calc, which counts the number of words within a calc cell. After adding the extension, the office must be restarted (including terminating the quickstarter) to make the function appear in the function list. Your example (Please send more examples, so that they can be added here). In the following you find the full description about how UNO features are mapped to the python language. integer types (byte, short, unsigned short, long, unsigned long, hyper, unsigned hyper Python internally knows only the C datatypes long and long long as integer types. On most machines, a long is a 32 bit value while long long is a 64 bit value. Values which have the type byte, short, unsigned short, long or unsigned long are converted to a python long value. Values which have the type hyper or unsigned hyper are converted to a python long long. If there is a concrete type in the idl method signature, the value is converted to the concrete type (in fact the invocation service does this work). If the method signature just has an any, every integer value is converted to the smallest data type, where the value fits into and send to the UNO object ( so 5 becomes a byte, 150 becomes a short, 0x1f023 becomes a long and values larger than 0xffffffff become a hyper. boolean Python internally has a boolean data type, which is derived from the integer type ( see http://python.org/peps/pep-0285.html ). There exists the singletons True and False, which pyuno uses to distinguish between integers and boolean values. However, when you want to explicitly pass a boolean, where only an any is specified, you must use True or False. # e.g. in the service specification. # probably not be able to deal with it correctly. Note: There also exists the uno.Bool class, which has been deprecated since pyuno 0.9.2, but still supported. Don't use it anymore. In general, the string is mapped to the python Unicode string. However, you may pass an 8 bit python string where a UNO string is expected, the bridge converts the 8 bit string to a Unicode string using the system locale. A char is mapped to a uno.Char. It has a public Unicode string member value with length 1 containing the Unicode char. enum A concrete enum value is represented by an instance of the class uno.Enum. It has two members, typeName is a string containing the name of the enum type and value contains the value of the enum. The first solution has the advantage, that a misspelled enum name already leads to a RuntimeException, when the python source file is imported. type A type is mapped to a uno.Type. It has public members typeName (string) and typeClass (enum value of com.sun.star.uno.TypeClass). There exists a function uno.getTypeByName() to easily create a type instance, the functions raises a RuntimeException in case the type is unknown. struct (and exception) For each UNO struct (or exception), a new python class is generated on the fly. It is guaranteed, that there is only one instance of the struct (or exception) class per python interpreter instance. The generated class does reflect the inheritance hierarchy of the concrete UNO type (e.g. important for exception handling, see below). One can generate a struct class by using the import mechanism. An instance of a struct can then be instantiated by using the python constructor. The constructor supports zero arguments (members get default constructed), 1 argument which the same type (copy constructor), and n arguments, where n is the number of elements of the concrete struct. The struct supports the equality operator, two structs are equal, if they are of the same type and each member is equal. An instance of a UNO struct can be initially constructed with the function uno.createUnoStruct() and passing the name of the struct as the first parameter and optional constructor arguments (see above for an example of possible ctors). ATTENTION: In UNO, structs have value semantic, however the handling in python does not reflect this. When a struct gets passed as a parameter to a function, the values are passed to the callee. Later modification of the struct instance does not influence the callee anymore. However, simply assigning a struct to another local variable does not create a copy, but simply creates an alias to the original instance. struct2.Name = "python"           # modifies also struct, probably not desired ! unoObject.call( struct, struct2 ) # passes the same struct 2 times ! # in python, you possibly modify the callee's value. # Don't do this ! sequence A sequence is in general mapped to a python tuple. A python list is not (!) accepted. # but this does not work ! out.writeBytes( "abc" ) # ERROR, no implicit conversion supported by the runtime ! A constant is its value and only its value. As modification of the constant values is incompatible, one may simply rely on the values. This solution is the most readable one. Might be useful from time to time. Function raises a RuntimeException in case the constant is unknown. any In general, the python programmer does not come into touch with anys. At all places where anys appear in method signatures, the python programmer can simply pass a concrete value. Consequently, return values or out parameters also never contain a concrete any. However, there are certain circumstances, where a python programmer may want to pass a concrete typed value to a callee (note, this is only possible for 'bridged' calls, you can't pass a typed any to another python uno object). You can create a uno.Any() by passing the type (as typename or as uno.Type) and the value. These anys can only be used in conjunction with the uno.invoke, which allows to invoke a method on an arbitrary UNO object with a typed any. When obj is a bridged object, the callee gets the sequence as a sequence<short>. When obj is a local python object, it gets simply the (4,5) as it would have got it with the normal call. One may use python classes to implement UNO objects. Instances of a python class may then be passed as argument to UNO calls where anys or concrete interfaces are specified. To be an UNO object, a python class MUST implement the com.sun.star.lang.XTypeProvider interface by implementing two methods getTypes() and getImplementationId(), which inform the python-UNO bridge, which concrete UNO interfaces the python class implements. The getTypes() function defines, which interfaces are implemented by the class. To make this easier, there exists a unohelper.Base class, where a python UNO object should derive from. You can then implement a UNO interface simply by deriving from the wanted interfaces. The following example implements a com.sun.star.io.XOutputStream, which stores all data written into the stream within a ByteSequence. (Note that this is quite a poor implementation, which is just for demonstration purposes). From the list of base classes given (here only XOutputStream), the unohelper.Base implementation correctly implements the XTypeProvider interface. There exists a loader for python components. It allows to create instances of python classes not just within the python process but in every arbitrary UNO process including OpenOffice.org. The python loader loads the python runtime on demand if it is not already loaded and executes python code within the root python interpreter. If the reader is unfamiliar with the component registration process, it should visit the OpenOffice.org developer manual for a comprehensive explanation. vnd.openoffice.pymodule The protocol dependent part is interpreted as a python module name, which is imported using the common python import mechanism (which uses the PYTHONPATH environment variable). Using this url e.g. in XLoader.activate() will try to load a MyPythonComponent.py file from directories, which are listed within the PYTHONPATH environment/bootstrap variable. Note that you must not use the .py suffix here. The given module is added to the sys.modules hash map. file A mandatory absolute file url to a python component file. The file itself does not need to be contained within PYTHONPATH, but it may only import files, which are contained within PYTHONPATH. The module is not added to sys.modules. vnd.sun.star.expand The python loader supports the common macro expansion mechanisms as the Java or C++ loader does. After the module has been imported, the python loader looks for a module-global variable with the name g_ImplementationHelper, which is expected to be an instance of unohelper.ImplementationHelper. The following sample code makes a uno component out of the above UNO object ( note that the component is not useful, because there is no UNO method to retrieve the tuple nor does a com.sun.star.io.OutputStream service specification exist, it's just here as an example). # The component must have a ctor with the component context as argument. # which the loader uses to register/instantiate the component. , but note, that this command creates a copy of the file (when the script changes,it must be redeployed using the above command). #       as a placeholder if more args would follow ! This also emphasizes, that out-parameters are quite close to multiple return values (though the semantic association of a inout parameter gets lost). you must have the correct number of return values either in the calling and implementing code, otherwise you will get a RuntimeException during the call. a void method always returns a None followed by possible out parameters, so when you have a void method with one out parameter you must assign the output to two variables (though the first one will always be None). a python object implementing a void method with out parameters MUST always return None as the first parameter. 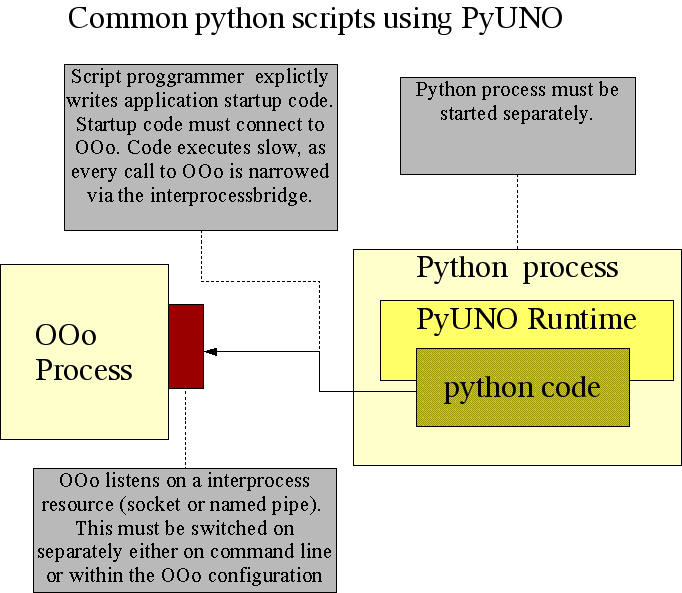 The Python-UNO bridge uses the common Python exception handling mechanism. For every UNO exception, a concrete exception class is generated on the fly (see above type mapping table for an explanation how to do this). print "The OpenOffice.org process is not started or does not listen on the resource ("+e.Message+")"
print "The url is invalid ( "+ e.Message+ ")"
pyuno supports the uno current context concept. There exist the functions uno.getCurrentContext() und uno.setCurrentContext( newContext ). # ... do some uno calls, which may interpret the "My42"
(Note, the oldContext may also be None). The unohelper.py module contains some extra functions/classes, which are nice to use with pyuno, but not mandatory. This paragraph lists some of the unohelper.py features. def systemPathToFileUrl( systemPath ) Returns a file-url for the given system path. Most of the OOo API functions expect a file-url, while the python runtime functions in general only work with system paths. The function is implemented using the core C function osl_getFileUrlFromSystemPath(). def fileUrlToSystemPath( url ) Returns a system path (determined by the system, the python interpreter is running on). Most OOo function return a file-url, while most python runtime functions expect system paths. The function is implemented by using the core osl_getSystemPathFromFileUrl() function. def absolutize( path, relativeUrl ) Returns an absolute file url from a given, mandatory absolute, directory url and a relative file url, which may be absolute or relative (which includes e.g. ../ parts. The function is implemented by using the core osl_getAbsolutePathFromFileUrl() function. def addComponentsToContext( toBeExtendedContext, contextRuntime, componentUrls, loaderName ) This functions adds a tuple of component urls to the toBeExtendedContext using the contextRuntime to instantiate the loader loaderName and some other services needed for this task. After completing the function, all services within these components can be instantiated as long as the toBeExtendedContext is not disposed. The changes are not made persistent. def inspect( unoobject, file ) Dumps the typeinformation about the given UNO object into a file (in fact, file needs to be an instance of a class, that implements a write method). The typeinformation include implementation name, supported services, supported interfaces, supported methods and supported properties. Before the pythonloader tries to load a new python unocomponent, it looks beside the uno component for a file with the name pythonpath.zip or a directory named pythonpath . If it exists, it puts it into sys.path (if it is not already in there) and then tries to load the given component. Note, that the unocomponent file itself is not within PYTHONPATH and thus cannot be reimported by other modules. This now means that python uno components can be implemented with an arbirtrary number of python source files which can be deployed/undeployed via the uno package mechanism. It also means, that you can now use the unohelper.Base implementation even if you have defined your own interface types (by lazy loading the new types so that they don't get used during registration process). Have a look at the sample calc addin to see how it works. code added through this mechanism can only be changed with a restart of the office process (as it got added to sys.modules). This is especially limitation for script developers. two independend uno packages from different developers may interfere each other, when they have name clashes in their code (e.g. same 3rd party product, but different versions). This chapter is most interesting for people who want to use the Python-UNO bridge independently from OpenOffice.org. Unlike the Java or C++ UNO binding, the python UNO binding is not self contained. It requires the C++ UNO binding and additional scripting components. These additional components currently live in the shared libraries typeconverter.uno, invocation.uno, corereflection.uno, introspection.uno, invocadapt.uno, proxyfac.uno, pythonloader.uno (on windows typeconverter.uno.dll,...; unix typeconverter.uno.so,...). Often, the components for setting up an interprocess connection are also required. These are uuresolver.uno, connector.uno, remotebridge.uno, bridgefac.uno shared libraries. The path environment variables ( LD_LIBRARY_PATH on Unix, PATH on Windows) must point to a directory, where the core UNO libraries, the above listed components and the pyuno shared library is located. (On Unix, there exists two files: libpyuno.so containing the code and a pyuno.so which is needed for importing a native python module). Additionally, the python module uno.py, unohelper.py and pythonloader.py must be located in a directory, which is listed in the PYTHONPATH environment variable. When the uno module gets first imported from an arbitrary python script, it must bootstrap a properly prepared UNO component context. As the python programmer can't (and probably doesn't want to) give parameters while importing a module, the python-uno binding uses the pyuno[rc|.ini] file located beside the pyuno shared library to bootstrap the UNO context (see uno bootstrap variable concept). The bootstrap variables UNO_SERVICES must point to a registry file where the components, given above, were registered. OOo by default ships with the Python-2.2.2 core runtime. This is fine for most users, but some hackers (or Linux distributors) may want to replace the runtime with the python system's installation, which may contain more optional packages that you want to use in python. The replacement is a little complicated however you just need an installed python and office. The path elements must be entered as absolute file urls (note that you need to escape using url syntax, for example a space is represented by %20). The PYTHONPATH must point to the root python library location and to OOo program directory. Add other libraries as you need them ( space separated). On Linux, you can use both use python-2.2 or python 2.3, but when using the latter, you get a warning on stderr (informing you about the version mismatch) when starting python or the office, to avoid the warning, you need to rebuild pyuno with python-2.3 (see below), however I haven't noticed any difficulties because of the version mismatch. You need a python configured with the --enable-shared option. When OOo and python were not built with the same gcc compiler version, you also need to rebuild python, because the default python uses some bad switches during linking. Switch to the OpenOffice.org directory and move away the python runtime coming with OOo. Add the office/program directory to the LD_LIBRARY_PATH and PYTHONPATH variable. Create the file pythonloader.unorc in the office/program directory. The path elements must be entered as absolute file urls (note that you need to use URL escape sequences for example replacing spaces with a %20). The PYTHONPATH must point to the root python library location and to OOo program directory. Add other libraries as you need them (space separated). You should now be able to start system's python and type 'import uno'. If this works fine, use pkgchk to deploy your script, for example the above swritercomp.py in OpenOffice.org (Tip: add a print sys.version to it). If this works fine, python should work well in OpenOffice.org itself. I did only some rudimentary tests, but I didn't notice any significant problems. Let us know, if you have some. Note that the Bibus project uses an extended python 2.2.2 with the wxPython/wxWindows extension for the GUI. You'll need to install OOo buildenv to do this. In the shell, replace the the PYTHONPATH variable properly, e.g. Make sure, that system's python is in the PATH variable. Build the office (or at least all components, pyuno depends on) but leave out the python module. In the pyuno module itself, you should only build pyuno/source/module, pyuno/source/loader and pyuno/test, leave out the zipcore directory. You'll need to modify the pyuno/source/module/makefile.mk and pyuno/source/loader/makefile.mk. Replace the CFLAGS+= line with CFLAGS+=-I/usr/local/include/python2.3 and all occurrences of -lpython with -lpython2.3. When the test runs fine, you can now replace pyuno.so, libpyuno.so and pythonloader.uno.so in the office with your rebuilt version. In case you have modified python or pyuno, you should at least run the following regression tests. Build installation sets and install openoffice. (should work without any errors). Start the office and add the pyuno_hello_world.zip from the above pyuno-doc.zip by using Tools/Package Manager. Why do I get a 'bus error' when starting the hello-world-script on Solaris ? There seems to be a corrupted version of the libpyuno.so in the OpenOffice.org1.1.0 installation set. The reason is not yet clear, might be either a bug in pyuno code or a build error. Please download libpyuno.so.gz to patch OOo1.1.0 version (do not apply this patch on any other version than OOo1.1.0 Solaris sparc!). Why do I get a 'SystemError: pyuno runtime is not initialized, ...' when starting the script ? Simply cut and paste them into a text editor to create them. There have been reported some failures with the above error message, which have not been resolved yet. You may want to follow #i17339#. Why do I get a 'SystemError: _PyImport_FixupExtension: module pyuno not loaded' when starting the script ? This generally happens when you still start the system's python installation. OpenOffice.org ships a python installation (because python and the office must have been built with the identical compiler version). Please check this with 'which python'. Simply use OpenOffice.org's python with absolute path names, for example use /usr/local/OpenOffice.org1.1/program/python myscript.py. Why do I get a "error: python-loader:'No module named pythonloader'" when running pkgchk with a python component ? Make sure to unset PYTHONPATH and PYTHONHOME (which you may have set, because you have another python installed on your system) environment variables before running soffice AND pkgchk. This is a workaround, We are currently thinking about a better solution. Why do I get an error message 'msvcr70.dll or python22.dll not found' when starting python ? You probably try to start python from the exe not the bat file, for example, c:\program files\OpenOffice.org1.1\program\python-runtime\bin\python.exe, but you have to use c:\program files\OpenOffice.org1.1\program\python.bat. Why do I get 'PYTHONPATH=... is not an identifier' when starting python ? This bug is fixed with OOo 1.1.1. I already have python installed on my system, why does the office ship another python ? python must have been compiled with the same C++ compiler as the office itself on all platforms that use the gcc compiler (e.g. Linux, BSD, etc.). On most Unix platforms, no python shared libraries are available by default (though some distributions do so). This would have meant, that python UNO components cannot be executed within the office process. Python component developers need a guaranteed minimum platform which they can rely on. Recognition of a python runtime at the installation system would have been an extremely difficult and time consuming task becausemany different python installation schemes exist. Packagers of OpenOffice.org will create their own packages, for example redhat or debian, without Python. The standard distribution must run on low end systems. Can I use system's python installation ? Why does my UNO component crash OpenOffice.org, while the sample UNO component runs fine? There is a known bug in the office, see #i13377#, which was not fixed for OpenOffice.org1.1. The office in general crashes, when a python script leads to an unhandled exception (for example an attribute error). You may try to workaround this bug by adding a try: except: level in your trigger() implementation, which dumps an error message to stdout/stderr, but sadly this will not help in all cases (for example compilation failure for some reason, please follow the issue for further information). Of course, there may be other reasons for a crash, you will only know, when you try to retrieve a native callstack (for example by using gdb). Why doesn't Python's xml parser (expat) or the zip module work for me? These libraries don't yet get built for OOo1.1. This will change for OOo2.0. Alternatively you may use OpenOffice.org's xml parser service (see service com.sun.star.xml.sax.Parser) or the zip content provider (see http://ucb.openoffice.org). Why doesn't socket and sre module work in OOo1.1. python distribution on windows? This is a known bug on windows in the OOo1.1 build. This should be fixed for OOo1.1.1 (see issue 21281 ). It should work for the other platforms. You can workaround this by downloading the official windows python distribution (see http://www.python.org) and replacing the appropriate .pyd files in the OOo's python installation. The samples are running fine, but how do I get more information about the API ? The semantics of the OpenOffice.org API is a very complex topic, which can't be discussed in this python document. Try to gather information from other resources, especially from the developer manual (see below). Most examples in the devguide are in Java. How do I translate them to python code ? You don't need this intermediate oInterface variable anymore. So the python code simplifies the example a lot, with a little training, you shouldn't have too many problems to translating Java to python code. Why can't I call the print method? Why can't I do a replace on the 'NumberingRules' object ? This is the only place, where the uno.Any is used. Using the uno.Any in normal calls will lead to RuntimeExceptions. A python uno object implementation will never receive an instance of uno.Any() as a incoming parameter, instead always the value within the is passed. This solution looks really ugly, but it allows you to continue, where you otherwise could only give up or use to another implementation language. How can I activate encoding iso8859-1 for OpenOffice.org's python installation ? (or any other encoding you wish). However, note that this is generally not such a good idea. It would be much cleaner to do the necessary conversions explicitly in the code, for example using Unicode(x, 'iso8859-1'). Packages listed here can be taken as a demo of what is possible with pyuno. Let me know, if you are aware of other extensions using pyuno. PyUNO is currently (and will be in future) maintained by myself in my spare time. My main aim for pyuno is to provide a good integration of OpenOffice.org's component model into python. Some guys on dev@udk.openoffice.org demand to have a more feature rich python runtime in OpenOffice.org and an integration with the system's python installation. While this is an understandable demand, it is not one of my favourite topics to work on and it involves quite a lot of work. As I also spend time on the creation of a postgresql driver for OpenOffice.org, there is simply no time left for this task. So I am looking for other volunteers such as you to fill this gap. In case you are interested, let me know via the dev@udk.openoffice.org mailing list or drop me a mail privately. OOo currently uses python 2.2.2 with OOo 1.1.x and python 2.3.4, which is considerably old already. Someone doing this will mainly spend time in the python module of the OpenOffice.org buildtree, where the python tarball gets extracted, patched and built. This is a very platform dependent task, typically for Mac OS X you'll need to do a lot of patches. Reintegrate OOo's patches to python into the python source tree (if sensible) A lot of patches get applied to the python source tarball, before it is built for OpenOffice.org. You would need to review the patches and try to convince with the python code maintainers to integrate those patches (if sensible) into their source tree. This will make life easier when upgrading to future python versions. OOo build knowledge, understanding of the patches and discussion with the python community. changes in python itself Real integration with the system's python installation will only be possible, if python itself is modified. Unix: Is it really necessary, that the python executable is linked to libstdc++ library ? Shared library: python should be built by default as a shared library (on all platforms, where this is possible). Versioning: Python currently assumes, that native modules are built and run with identical python versions (otherwise warnings are issued). Newer python versions should guarantee binary backward compatibility for native modules built with older python versions. Discuss with the python community. PyUNO FAQ maintainer A lot of good questions on pyuno have already been, and will be, answered in future in the dev@udk.openoffice.org (or others) mailing lists. Someone should add it to the FAQ on this page. Follow OpenOffice.org mailing lists and maintain this page in CVS. Please use the dev@udk.openoffice.org mailing list for further questions.